All the top seeded boys’ and girls’ teams advanced to the Elite Eight of the DeKalb County Middle School Basketball Championships with wins in first round action on Wednesday. Undefeated and tournament No. 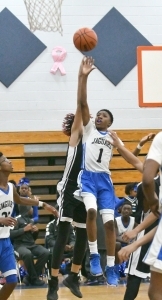 1 seed Stephenson advanced to the boys’ quarterfinals as the Jaguars knocked off the No. 4 seeded wildcat Lithonia (2-12) 71-22 to improve to 14-0 on the season. Eduardo Hendricks had a game-high 16 points to lead the Jaguars followed by Steven Moore with 14 and Christian King 10. Stephenson advances and will host the Chamblee Bulldogs (6-8) who came out of Region 1 as the No. 3 seed and knocked Region 4 No. 2 seed McNair (9-5) 41-36 at McNair High. The two teams meet at 10:00 am on Saturday at Stephenson. The Tucker Tigers (12-2) are the tournament’s No. 3 seed as the Region 1 winner and advanced with a 55-22 win over the No. 2 seeded wildcard Peachtree Patriots. Tucker hosts Region 2 No. 3 seed Champion Chargers (9-5) on Saturday at 11:15. The Chargers went on the road and knocked of Region 3 No. 2 seed Redan (8-6) 53-46 to advance. Cedar Grove (12-2) is the boys’ tournament No. 4 seed and the Saints moved into the Elite Eight with a 32-19 win over the No. 1 seeded wildcard Bethune (5-9). The Saints play host to the Region 2 No. 2 seed Druid Hills Dragons (10-4) on Saturday at 10:00 am following the Dragons 39-22 victory over Region 3 No. 3 seed Miller Grove (6-8). The boys’ tournament No. 2 seed Salem (13-1) hosted the No. 3 seeded wildcard Columbia Eagles (3-11) and advanced to the quarterfinals with a 54-26 victory. Salem will host Henderson (7-7), the Region 1 No. 2 seed, which defeated Chapel Hill (9-5) 33-24. All four of the girls’ No. 1 seeds advanced to the Elite Eight with home wins on Wednesday including Region 1 champ Henderson (11-3), the overall No. 3 seed, which dispatched Peachtree (4-10) 37-6. Sierra Burns hit for a game-high 18 points to lead the Lady Cougars in the win. Henderson faces off with Region 3 No. 2 seed Lithonia (12-2) on Saturday at 10:00 after the Lady Bulldogs knocked off Druid Hills (5-9) 32-26 to advance. The Champion Lady Chargers (13-1), the tournament’s No. 2 overall seed, defeated Freedom (2-12) 43-9 to move on to the quarterfinals. Myori Pruitt hit for 16 points and Jayla Thomas added 8 in the victory. Champion faces off with Region 1 No. 3 seed Chamblee Lady Bulldogs (6-8) at 10:00 am on Saturday at Tucker Middle. Chamblee pulled off the upset of the defending champions Region 4 No. 2 seed Chapel Hill Lady Panthers (7-7) with a 32-17 road win. The surprising McNair Lady Mustangs (9-5), the tournament’s overall No. 4 seed and Region 4 champ, defeated Redan (7-7) 38-28 to advance to the quarterfinals. McNair will host Region 2 No. 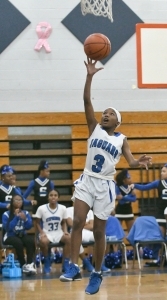 2 seed Stephenson Lady Jaguars (13-1) who advanced with a 37-17 win over Region 3 No. 3 seed Miller Grove (8-6). The game will be played on Saturday at 10:00 am at McNair High. The tournament’s No. 1 overall seed Salem Lady Lions (13-1) rolled past Cedar Grove (2-12) 51-23 to move into the quarterfinals on Saturday. Salem hosts the Region 1 No. 2 seed Tucker Lady Tigers (10-4) who earned a berth in the quarterfinals with a 34-13 win over the Columbia Lady Eagles (8-6). The game at Salem is set for a 10:00 am start. Tucker and Stephenson are set to host the semifinals on Wednesday, Feb. 6 with the championship and consolation games set for Cedar Grove Middle on Saturday, Feb. 9.